The New Community Bible provides a fresh, new translation of the Bible with commentaries provided by leading biblical scholars. It has clear introductions to each book and extensive notes throughout to help ensure that the biblical texts are accessible and spiritually nourishing for readers. 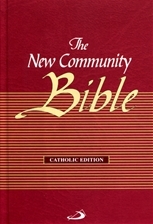 As its name suggests, it is a community or pastoral Bible that can be read by individuals or by small groups in the absence of a biblical expert. The Psalms are included in a larger type as an aid to prayer. "Now is the time when we have to become a more biblical Church, a people more immersed in the word of God. This is the best way to know Jesus whose voice we hear and whose face we see on every page of the Bible. That is why The New Community Bible (international edition) is such a gift. May it find its way into many hands and hearts and homes in this time of grace and faith."